• Respond to the invitation. • Dress according to the occasion. Never “out dress’’ the host/hostess. • Do not be late. • Take your seat at the table only after the host/hostess. A man may help a woman seat comfortably to his right and then the other ladies in the clockwise direction. The lady has to offer a simple thank you. 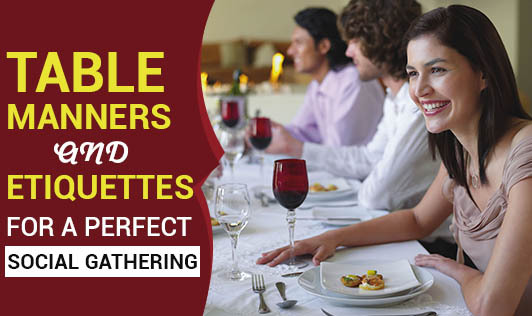 • Place the napkin in your lap only after the host/ hostess does. Do not slouch at the table. Keep your hands on your lap and not on the table. Do not keep your mobile, wallets or purse on the table. • Hold your knife and fork firmly with the handles in the palm of the hand. • While eating, if you want to rest the knife, place it on either side of the plate. • If you do not like the food presented to you, at least make an attempt to eat a small portion of it. • Do not take large portions and waste food,, and on the other hand, do not leave the plate fully clean!! • Make sure to thank the host/hostess for their hospitality before leaving. • It is bad etiquette to dip your bread in the soups or sauces serving bowl. • Do not make loud eating noises like slurping and burping. This can be very impolite. • Do not talk when your mouth is full. It is not only unpleasant for others to look at it but can also choke. • Don’t stretch yourself across the table to reach to food. Instead, ask a guest sitting close by to pass the dish you want. • Diplomacy is important at the table. Do not comment or criticise on the choice of food by the host/hostess or any other guest. • Drinking too much can be embarrassing. Drink sensibly.